Board games for improvisors can be a lot of fun, especially with many non-traditional games that have been published in the last decade or so. So which ones should you buy for your friend or family member the improvisor, or your own improv group? Traditional board games like Monopoly, Scrabble and Trivial Pursuit, and simpler games like Trouble and KerPlunk, are still amongst the defaults given as Christmas and birthday gifts, at least in Australia. With card games, Uno is still a classic, but recent games like Sleeping Queens and Loot are also becoming popular gifts for both children and adults. In fact we’ve spent many hours playing Loot with just adults. These games are all still fun, but for improvisors there’s more choice than ever before. For the last 20 years, many European style and party games have appeared that have taken board and card games to a new level, reducing luck, and adding social interaction which can affect the outcome of the game. And more recently actually requiring social interaction to play and win. Some of these games are great for improvisors, because they use improv skills. These include acting/deception, telling stories, working as a team and improvising logic and tactics on the fly. Many of these games are called bluffing games, but this confuses them with simple bluffing used in games like poker. When board games refer to bluffing, in many cases they really mean acting and deception. So which are the best board games for improvisors? Here’s a few of our favourite games, which are even more fun for improvisors. Post a comment at the bottom and add your own suggestions. The elimination party game Werewolf, originally based on a social deduction game called Mafia, has become popular in recent years, particularly for large groups, including improvisors. Especially since there is no official game you can buy, or any copyright on the game itself. In fact all you need is a deck of standard playing cards. Each player is given a secret role, with a few players becoming werewolves, and the majority becoming villagers. Over successive nights the werewolves kill a villager, and over successive days, the the group votes to kill off a player they suspect is a werewolf. The game continues until either only the werewolves are left, or until all the werewolves are killed. Between each night and day killing, the group discusses who to kill off as being a werewolf, with much lying and deception about who the werewolves might be. The entire game therefore is about emergent social interaction, and your ability to manipulate it to your own will. No dice, no boards, no randomness, no luck. It all comes down to how well you can deceive people and form relationships. The main problem with the game is that when you’re killed, you must sit out and shut up for the rest of the game, which could take up to an hour depending on the size of the group and how they’re socially engaged. After a number of years, game companies started publishing purchasable versions of the game, with numerous other role cards and other custom variations. However the elimination problem remains. Which brings us to the last 10 years, when a number of Werewolf variations games have appeared which successfully removed player elimination. Bezier Games. 3-10 players. Ages 8+. Of the no–elimination Werewolf games on the market, the one which most closely resembles the original party game is One Night Ultimate Werewolf (ONUW). In ONUW, each player is give a secret role, the same as the original game, including villagers, werewolves, and a number of other roles customisable within the game. There is only one day and night phase. During the night phase, each player with a custom role is given the opportunity to make a secret change to the roles each player was originally given. During the day phase, the group has only a limited number of minutes to vote who to kill. And that’s it. The fun is trying to work out who made changes to the roles, what the changes were, and who is completely lying about it all. ONUW is all about deception, logically finding allies, and improvising tactics on the fly. Getting the right role mix for a particular group size can take time, needing a balance between simple and complex logic for role changes. But once that’s figured out, you can play again and again without getting bored of the mechanics. The only advice we’d give, is make sure everyone is clear that lying and deception is the name of the game, and if children are playing — the game is for 8 years old and above — then make it clear before the game that parents lying and trying to kill them is just part of the game. Indie Boards & Cards. 5-10 players. Ages 13+. The Resistance is another successful fix of the Werewolf elimination problem, and our personal favourite. Instead of having only one night and day phase, there are seven, and points are allocated each day instead of killing off a player. And instead of werewolves and villagers, the theme is a dystopian universe where the resistance goes on missions to attack the corrupt government. The villagers are the resistance fighters, and the werewolves are the government spies within their midst. The game is more difficult for younger players, hence the 13+ age designation. We’ve seen 9 year olds play with adult assistance, although they don’t fully grasp the more intense deception required to win. And with ONUW and even the original Werewolf, there are times you can just fly under the radar for a while, whereas with The Resistance, it’s more difficult to hide, and requires more complex lying or logical analysis to win. Cryptozoic Entertainment. 3-8 players. Ages 13+. Spyfall is considered a bluffing game, but is more an improvised acting game if played as recommended. There are 30 different real world locations, each with unique roles that may be found in that location. A location is selected at random, and each player is given a card with a unique role on it for that location, except for one player at random who is given a blank SPY card. It is the spy’s job to figure out the location based on the questions asked but the other players, and the other players’ job is to figure out who the spy is. Play begins with one player asking another player a question, which is loaded with enough information to signal to the player that they know the location, but not enough for the spy to figure it out. Questions can be about anything, and they’re completely made up by the player who is asking. Once the other player has answered the question, it is their turn to ask someone else. The difficulty is when the spy is asked, and they thus have to fake their answer in a way that suggests they do know the location and are therefore not the spy. In the basic game with not so socially interactive players, the questions will suffice as the only game mechanics. However if you decide to actually take on the roles you’re given, then you can begin to act out the questions and answers as proper character interactions. And this is what makes it fun for improvisors, having to justify everything they say, without having all of the information they need to do so. On the other hand, improvisors might find the game a little limiting, but when improvisors play with non-improvisors, it often brings out the improvisor in non-improvisors! When playing with children, we suggest going through every location before playing the game, and removing any that they don’t know, or they think they would find difficult. Many of the role cards would also not make sense to younger players, so also tell them that if they don’t know what the role is, to just make one up that you’d find in that location. Spyfall was a Kickstarter project — it was funded and tested by members of the public. A later version Spyfall 2 increases the number of players to 12, and includes an additional spy. Oxford Games. 4+ players. Ages 8+. Ex Libris is a party game by Leslie Scott, who coincidentally also invented Jenga. There’s a few different games titled Ex Libris. This is the one titled Ex Libris: The Game of First Lines and Last Words. The aim of the game is to write the best fake starting or ending sentence of a real book, given the book’s title, the name of the author and a short synopsis. Each player writes their sentence in secret, after which they are all read out, including the actual sentence from the book as if it was also written by a player. Everyone then votes on which they think is the real sentence. Oxford Games joined with The British Library and The Bodleian Library Oxford to select and publish the starting and ending sentences from 100 famous books, and the libraries also get a royalty from each game sold. So buying the game is also helping libraries prosper! While literary fans will do well with genre, don’t be surprised if players not familiar with the books also do well. We’ve seen children as young as 8 fool a dozen adults into thinking their writing is from the original book. This is a great game for improvisors and non-improvisors alike, which at the same time educates players in various writing styles and their most common authors. Difficult to find in the shops, it is best ordered online directly from Oxford Games. There is also an extension pack available with additional books. Czech Games. 2-8+ players. Ages 14+. Codenames became popular very quickly when it came out a few years ago, winning lots of awards, and now with at least 5 follow up versions and extensions being available. The play area is a 5 x 5 grid of cards containing a single word. Underneath each card, is a red or blue coloured picture of one of a number of spies, or an assassin, or one of a number of bystanders. There are two teams, red and blue, and each team tries to identify all the spies of their colour in the grid. One player from each team is the spymaster who knows the layout of the grid, and gives a one word clue which identifies one or more cards, which the remaining players use to choose which cards to turn over. Turn over all the spies for your team first, and you win. Turn over the assassin and you lose. The original game uses words on each card. So for example if the spymaster gives the clue for two possible cards as “chair”, this might match the cards containing “sitting” and “meeting”, but might also arguably match “dinner” or “study”. Part of the fun is how the team players discuss and dissect each clue and figure out which cards should be turned over. How well you know the spymaster and how their brain works can help, but sometimes it does the opposite. Any discussion the team has, is also heard by the opposing team, which can gives away clues if the team isn’t careful. There’s also a picture version of Codenames, which is often confused as a children’s game if only played superficially. But we’ve seen up to 8 adult players so engrossed that the tension rises enough for arguments to break out. You can mix and match the pictures and words in a single game if you have both editions. It’s an interesting game for improvisors due to the word associations, connections and patterns, and the need for group mind amongst team members. And although it’s rated at 14+, we’ve had 8 year olds play successfully. Gamewright. 2-5 players. Ages 10+. 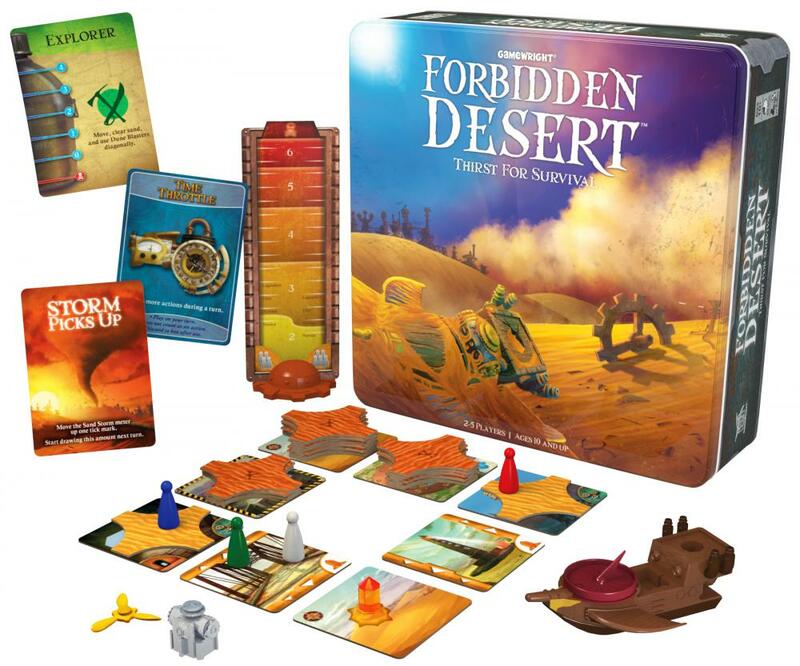 Forbidden Desert is one of the most popular co–operative games, in which you play as a team against the game — although this is actually the second of such games by this designer. If the team wins, you all win. If the team loses, you all lose. No individual player wins, loses, or is positioned differently than the other players at the end of the game. Great for improv team building, and sometimes for team destroying. The players are explorers looking for the parts to a flying machine which will allow them to escape the desert in which they are stranded. Each player takes their own turn, but the moves they make are decided by the whole team in group discussion. The game is perfectly optimised so that only the best team work will win the game, and disagreements can quickly lead to losing the game buried under mountains of sand. Actually the photo to the right is deceptive, because while the game uses a card grid, it’s a 5 x 5 grid, not a 3 x 3 grid. Gamewright. Any number of players. Ages 8+. 9 cubes, each with different pictures, which when rolled together form over 10 million combinations. Roll one and start narrating a story. 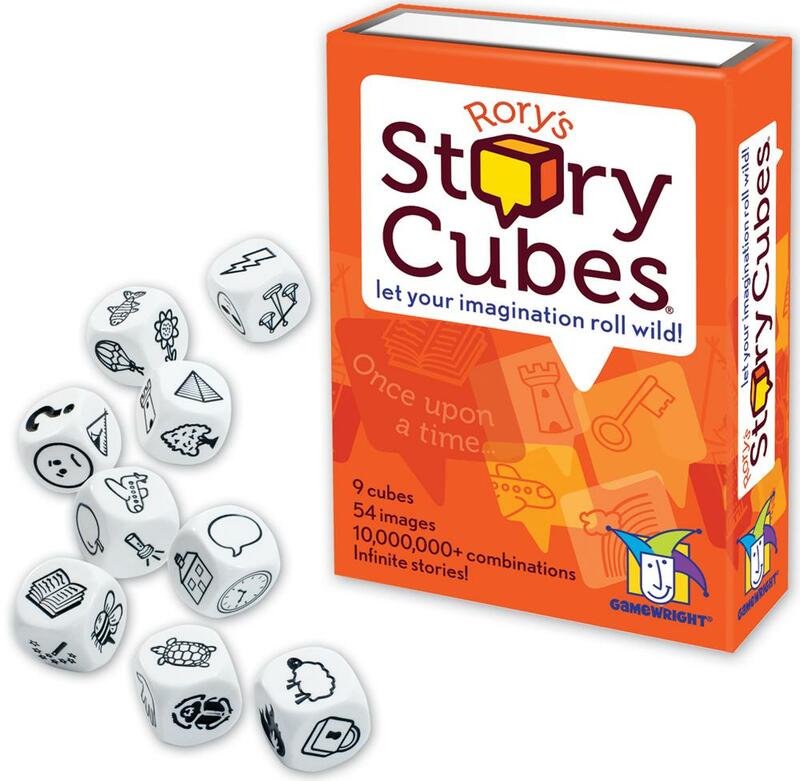 Roll another and link it to the story in some way, continuing on until the final cube is rolled to find an end to the story. Simple yet fun for improvisors — Chicago method improvisors will get better at storytelling, and the Johnstone trained will have fun telling stories like they already do. There’s also an interesting theatre game you can play with them. Have an audience member come up and roll each cube as a scene is played out, in which the players must incorporate each new cube. There’s also lots of older games that are more fun for improvisors than non improvisors. Here’s a quick list of the ones we enjoy. And don’t forget, as improvisors we love to adapt and improvise, so add or remove rules from games as you see fit. For example in Scattergories, you might want each word in the list to tell a story, or in articulate you might want to play as teams, or even sing the descriptions or use rhyming couplets. Scattergories — Players write words in various categories which start with a randomly selected letter, but you can also score points by choosing words which are funny but not necessarily in the category. So for example names of things at a circus starting with the letter D might include Donald Trump. Charades — An old favourite, with improvisors having lots of fun over embellishing titles. Articulate — Again, improvisors have lots of fun describing the meanings of various words without saying the actual word, given a time limit. A few years back a director of a show I was in insisted that rehearsals include a game of fast and furious Articulate. Got your own suggestions? Let us know in the comments!